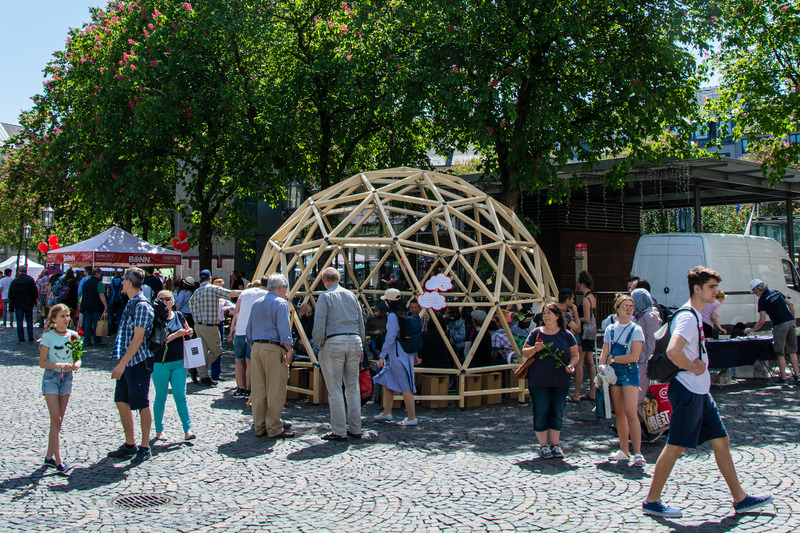 From May to August 2018, the European Public Sphere’s Europe Dome will be erected at various locations in North Rhine-Westphalia. In order to strengthen the European idea, we continuously need new ideas and initiatives that build bridges. We can only develop a more democratic Europe through an open debate. How do we want to shape our community in the 21st century? What role do education, science and art play? What can a European way of the economy and money look like? The exact time, location and the concrete topic for the respective event will be announced. The special thing about the European Public Sphere talks is that they take place under a geodesic dome – transparent and open for all. With its network structure (triangles connect to pentagons and hexagons and curve to the space) our dome is a symbol for the necessary democratic statics and cultural diversity of Europe and an image of the future for a solidary society in a globalized world. Everyone is invited to take an active part in the talks. The events will be documented and made publicly accessible. Gradually, an “archive of the future” for Europe is to be created. No matching events listed under NRW-Tour 2018. Please try viewing the full calendar for a complete list of events.